As part of its artists’ residency programme, ‘Sakiya: Art, Science, Agriculture’ is preparing to host the renowned Palestinian artist Samia Halaby, a New York resident, for two weeks in Ein Qinya, starting this month on the 25th of March. Halaby, also a researcher and art historian, is known for her abstract and experimental work. During her residency, Halaby will produce sculptures and paintings at Sakiya’s site, which includes two old houses dating back to 1917, one of which is currently undergoing its final restoration. 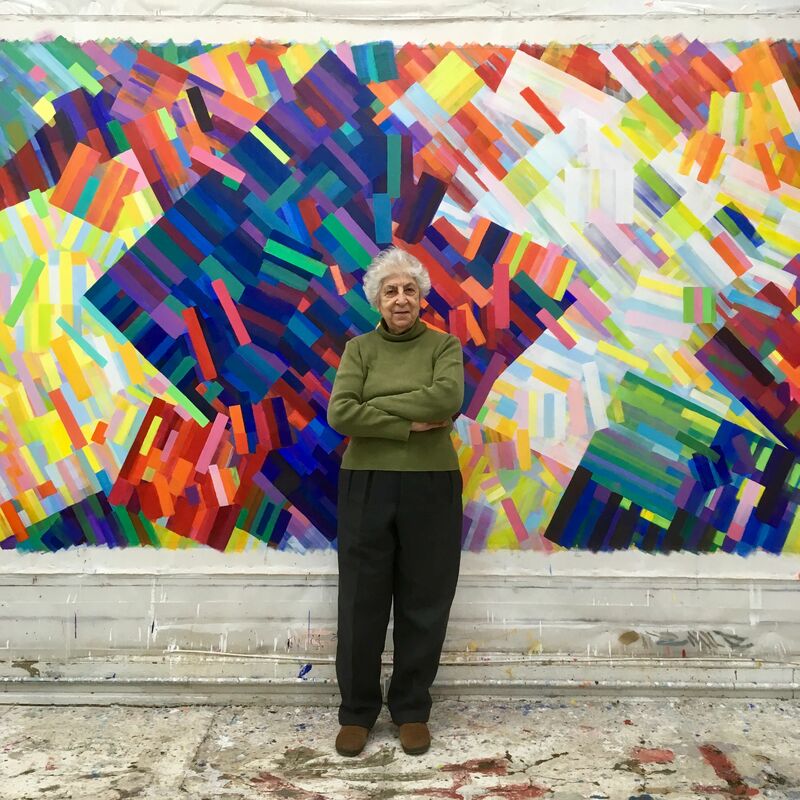 “Samia Halaby, through her art, offers a different way of looking, analysing and thinking about the world around us. She is also a permanent supporter of Sakiya,” Sahar Qawasmi, Sakiya’s director commented enthusiastically. “Her work in Sakiya will leave a beautiful and inspiring impression. Samia is distinguished by her academic work and her contribution to and support for education, as well as her historical and knowledge-based exploration in Palestine, which Sakiya considers is of great importance” Qawasmi added. Sakiya is a community-based art initiative supported by the A.M. Qattan Foundation through the ‘Visual Arts: A Flourishing Field’ Project, funded by Sweden. Sakiya was co-founded by Sahar Qawasmi and the artist Nida Sinokrot. It was inaugurated in the beginning of last year as a new cultural space integrating art, agriculture and science for experimental knowledge production and sharing, grafting a sustainable model through a residency programme, with farmers and craftsmen also playing a prominent role alongside artists and researchers. The project is located on a four-acre plot of land in Ein Qinya that is owned by the Zalatimo family. Sakiya initiated the project with a field survey of the site and surrounding area, a preliminary plan for restoration and a number of studies pertaining to the plants, environmental resources, geography and history of the area. With the assistance of a number of local, specialised craftsmen, and the participation of volunteers from local universities, work on the site has included cleaning the pond and water spring, paving a pedestrian road and restoring the stone terraces surrounding the house in a traditional manner. The building was eventually completely renovated and reinforced from the outside, as it faced structural issues that posed a threat of further destruction to the standing building. Since the beginning of 2018, Sakyia has hosted a number of artists and researchers, including Dr. Yara Al Sharif and Dr. Nasser Golzari, who teach architecture at the University of Westminster, London. Both professors are working on developing a concept plan for Sakiya on a regional level and examining the spatial opportunities of Sakiya’s location. In addition, Sakiya has hosted the singer Dina Amro. The singer researched the subject of water heritage, its connection to storytelling and songs inspired by it through the water spring and pond on Sakiya’s premises. Artist Yara Bamieh has also been a guest and experimented with different materials from around the premises to produce natural ink to use in her future artwork. Since the beginning of 2019 Sakiya has organised weekly activities and visits to explore and discuss some of the developing research. Some of the groundwork taking place pertains to the vegetation on the premises, that has been led by Dr. Omar Tesdell, and research on medicinal plants with Dr. Imad Hussein. Sakiya works in cooperation with Ein Qinya’s village council, the local residents and institutions, in line with its philosophy of community partnership and involvement. Sakiya seeks to cultivate the surrounding area to create and achieve a sustainable and replicable community project. ‘Visual Arts: A Flourishing Field’ Project’s grant contributes to the implementation of Sakiya’s art, agriculture and science programme, in addition to covering its operational expenses, which strengthens its sustainability. Most importantly, the project ensures resource mobilisation and improves the strategy, financial and administrative systems of this emerging institute.